night (exact time to be announced later), as well as signing autographs and participating on a panel. sold over 100,000 copies, an extraordinary figure for a traditional folk music release. performed in New York and Los Angeles. addition to a domestic tour that included 28 cities. In the meantime, they released their second U.S.
exchange event in Sweden and a TV commercial in Japan. album in the U.S., which is yet to be released. “The National Anthem” from Radiohead’s Kid A.
Yoshida Brothers continue to make not only Japan but also U.S., Europe, and Asia their stage. 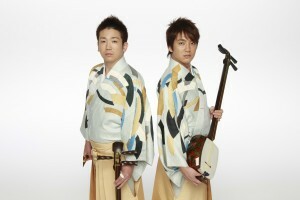 Baltimore, MD (February 3, 2010) – Award-winning global sensations the Yoshida Brothers, whose music builds on traditional Japanese music, will be guests at Otakon 2010. They will perform on Friday night (exact time to be announced later), as well as signing autographs and participating on a panel. The Yoshida Brothers were born in Noboribetsu, Hokkaido. Each picked up the shamisen at the tender age of 5, and began studying Tsugaru shamisen under Takashi Sasaki I in 1990. After sweeping prizes at national Tsugaru shamisen conventions, the brothers made their major debut in 1999. The debut album sold over 100,000 copies, an extraordinary figure for a traditional folk music release. In 2002, the brothers followed their success with their first national tour, “Live Soul.” performing in 30 cities. The following year, they made their U.S. debut with Yoshida Brothers from Domo Records and performed in New York and Los Angeles. An international release followed in Korea in 2004, where they performed their first concert in Seoul, in addition to a domestic tour that included 28 cities. In the meantime, they released their second U.S. album, Yoshida Brothers II, and went on a U.S. promotional tour, visiting seven cities. It was a year of significant breakthrough, through their participation in other various projects such as an international exchange event in Sweden and a TV commercial in Japan. In 2005, the brothers recorded an album in Los Angeles, followed by a West Coast tour and a concert in Hawaii. In 2006, they toured the U.S., Spain, and Hong Kong. In Hong Kong they released their very first greatest hits album and marked favorable sales. Domestically, they launched a shamisen-only national tour. And in 2007, their music created buzz in the U.S. as their music was used in the TV commercial for Nintendo’s Wii. At the end of that year, the brothers recorded another much-anticipated album in the U.S., which is yet to be released. In 2008, they released Best of Yoshida Brothers and toured in U.S. and Canada. They followed that in 2009 with Prism, for which the brothers collaborated with notable talents, including an inspired cover of “The National Anthem” from Radiohead’s Kid A.